One of the most enjoyable things to crochet is jewelry! Rings, earrings, necklace pendants, and brooches, all with the artistic flare yarn or thread naturally gives. Making your own jewelry says a lot and lends something noticeable to your appearance. To make this rose you begin with a strip of crocheted fabric and wind it around itself to resemble a rose. Then you simply sew it together from the bottom. Visit this page to see an example: How to Roll Up a Crocheted Rose. You can use this tiny rose on anything. 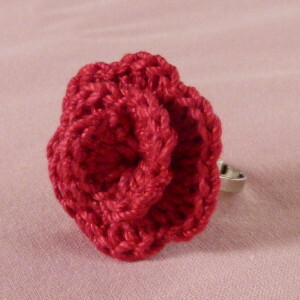 Here’s a tip: for a tiny rose, try size 10 crochet thread! Gauge Swatch: 1”w x 1”h (2.5cm x 2.5cm) ch 9. Roll strip around itself to form a rose and use tail and a yarn needle to sew together. Hot glue rose to ring. This is a super easy pattern to crochet and so much fun. If you have any questions, I’ll be glad to help! This entry was posted on Thursday, July 31st, 2014 at 12:00 AM by Amy	and is filed under Free Crochet Patterns. You can follow any responses to this entry through the RSS 2.0 feed. You can skip to the end and leave a response. Pinging is currently not allowed. Can you do the rose in any color? Also can you just crochet the ring instead of buying it?